Reading means waiting. Waiting for a favorite author’s next story to arrive. Waiting to discover the next great novelist. Waiting for the long-delayed installment in a popular fantasy series. Waiting for free time. For bedtime. For any time just to read. Fans of Louisiana’s greatest living writer, Ernest J. Gaines, endured nearly a quarter-century of waiting for a follow-up to his award-winning masterpiece A Lesson Before Dying. Since that novel’s 1993 publication, Gaines hardly stayed quiet. Already one of the nation’s most celebrated African-American writers, he was bestowed with prizes—including a National Medal of Arts and MacArthur Foundation “genius” grant, among others—and even knighted in France. He sold countless copies from his back catalog (The Autobiography of Miss Jane Pittman, A Gathering of Old Men), thanks to Oprah’s Book Club and nationwide campaigns that used Lesson to combat illiteracy. He oversaw the release of a collection of early stories and essays, Mozart and Leadbelly. 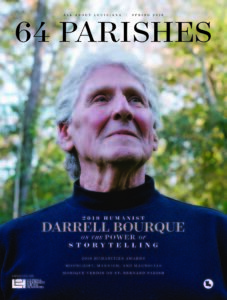 He taught and lectured and, with his wife, Dianne Saulney, built a home in Oscar, Louisiana, on the same Pointe Coupee Parish plantation where he was born. All the while, Gaines’s readers hoped for a return to Bayonne, the parish seat of St. Raphael, the fictional settings for most of his life’s work. Gaines’s novel, read more than a half-century later, feels immortal in its own anomalous way. Last summer’s slim novella, The Tragedy of Brady Sims, brings readers back to Bayonne with a bang. Literally. On the book’s very first page, the titular character rises from his courtroom chair and blasts a single, lethal pistol shot into his son, Jean-Pierre, who had just been sentenced to the state penitentiary for a bank robbery-turned-murder. The father’s motive is clear from the onset: he’d rather kill his boy than have him die in Angola. The tragic tale traces a local reporter’s search for a “human interest” angle, a simple task in the provincial community that is Bayonne, where men gather at the local barbershop to spin gossipy yarns. Gaines’s literary homecoming marks the perfect opportunity to revisit his first novel, Catherine Carmier. Expanded from an earlier short story and published in 1964, at a time when America’s leading black artists and activists were penning powerful, timeless texts (1963: Baldwin’s The Fire Next Time and King’s “Letter from Birmingham Jail”; 1965: The Autobiography of Malcolm X), Gaines’s novel, read more than a half-century later, feels immortal in its own anomalous way. This is a quiet book, but one that simmers just below the surface, smoldering with anger at the race-based injustice and inherent violence embedded in the culture of the Deep South. Jackson doesn’t like what he sees. Much like himself, Bayonne has changed, and not for the benefit of its black citizens. Longstanding sharecropping families have been evicted from their land. Their houses have been razed. Even the ballpark where Jackson used to play has been plowed under and planted with sugarcane and corn, like much of the black-owned property in Bayonne, which Gaines modeled after the town of New Roads, Louisiana. Just a single black farmer remains, Raoul Carmier, father of the eponymous Catherine, who stubbornly resists the encroachment of white, Cajun developers. “They have wrangled and wrangled until they have gotten everybody to quit farming,” Jackson’s old elementary school teacher tells him. Jackson burrows inside himself, while reluctantly lingering in Bayonne. He refuses to tell his aunt of his plans to leave by month’s end. Old friends, those few who remain, are afraid to talk to the educated outsider. The novel perfectly captures the alien feeling of returning home after a lengthy absence: the understanding looks, the muted conversations, agonizingly extended pauses, abrupt answers. The taciturn nods of heads. Early on, Gaines makes clear that reticence is not reserved only for the recently returned but also historically divides generations, genders, and especially races. In one powerful passage, a memory from the distant past, a black sharecropper asks a white landowner if he could resettle his family in an long-abandoned house nearer his fields. The landowner wavers, unable to immediately accept the request: “He lowered his head to look at the floor. He saw a grain of rice . . . and began moving it with the toe of his shoe. He moved it out, then in, from one side to the other; and still neither one of them said another word.” Request eventually granted, the family moves into the house. Months later, the sharecropper disappears. “Neither he nor [his] horse was ever seen gain,” Gaines writes, letting the silence that often accompanies violence seep into the narrative. Only Catherine Carmier, an old flame, is able to conjure up words from Jackson. They rekindle over surreptitious dates out of town. Her father would disapprove. Jackson reminds Raoul of his son, for a reason that becomes the book’s underlying thread of a secret. When the silence is broken, Gaines shows a gift for capturing Creole and Cajun dialects, linguistic candy for writers hungry for deliciously odd patterns of speech (“This here heat, there,” a simple declaration appearing early in the novel, might just be the truest sentence ever written in a south Louisiana tongue). Gaines turns eighty-five this January. Here’s hoping that he has a few more stories left to tell. Any visit to Bayonne is well worth the wait. Rien Fertel teaches, writes, and lives in and about the South.